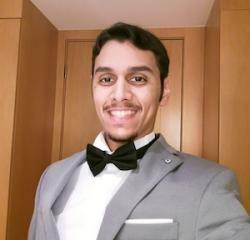 Hattan received his MS in Electrical Engineering from King Abdullah University of Science and Technology (KAUST) in 2013 with a concentration in Electro-Physics. Prior to joining Duke to pursue his PhD, Hattan worked as a management consultant, engineer and management professional for various firms. His current research interests are in high-performance nanoelectronics using 2D materials. In his leisure time, Hattan likes to spend time with his wife, play video games and watch the latest movies.